03 August 2018 | Story Kevin Winter and Peta Brom. Photo Andrew MassynRead time 6 min. Cities with continuous corridors and larger natural areas in excess of 50 hectares support greater biodiversity. But even community-level “stepping stones” of green infrastructure amid the urban landscape are better than nothing. Models of the earth’s changing climate suggest that extreme weather events, including droughts, will become more frequent. As city populations grow, it will be harder for governments to provide enough water for everyone. According to the World Resources Institute, the northern and southern parts of Africa will experience high to extremely high water stress if business as usual water usage continues until 2040. Faced with a drought, it’s tempting for city managers to reduce the amount of space that needs water. Parks, public areas and private gardens are usually the first to go. But there are good reasons to keep nature in cities, and there are ways to do it. Municipalities typically respond to a drought by limiting water use, and then to look at ways to cover spaces with artificial surfaces like paving instead of lawns and plants. But there are four reasons why that is a bad idea. Impervious surfaces seal the soil. Surface water can’t filter down to recharge the groundwater, and normal biological processes in the upper layers of soil are interrupted. Instead, rainwater goes into the storm-water system. Covering up nature reduces biodiversity and habitat quality. Urban nature becomes poorer and there’s less of it. Concrete, tar and masonry raise the temperature of built-up areas. Green open spaces mitigate this so-called urban heat island effect. Enjoying nature gives people the opportunity to be healthy and well. Nature in cities is good for people – and good for nature itself. Cities with continuous corridors and larger natural areas in excess of 50 hectares support greater biodiversity. But even community-level “stepping stones” of green infrastructure amid the urban landscape are better than nothing. “Stepping stones” aid more mobile species, such as birds and insects, to move around the city, reach bigger natural areas and find what they need for survival. As for people, even small daily doses of nature such as looking out of a window at a natural scene are good for health and wellness. Access to nature has been shown to improve cognitive functioning, reduce hypertension and speed up recovery times following illnesses. Yet it is these smaller, accessible, everyday forms of nature that are the most vulnerable to the conversion to artificial surfaces. Instead of covering up urban surfaces, there is an engineering solution in the form of low impact design that could be applied to water sensitive cities. It’s increasingly found in parks and gardens and it conserves water while preventing overloaded stormwater systems and depleted groundwater. These designs include lowered flower beds and bog gardens, rain-gardens and mulch-pits, infiltration trenches and swales (channels). The positive unintended consequences include providing breeding grounds for amphibians and dragonflies, stopovers for waterfowl and opportunities for recreation and education whilst contributing to lowering the ambient temperature within a city. Portland’s Tabor to the River project, in Oregon State, US, demonstrated that bio-swales running alongside streets have improved residents’ knowledge of stormwater and how the city fits into the broader ecosystem. A South African example of stormwater management to increase a sense of connection with nature can be found in Cape Town. The Edith Stephens Wetland Park Environmental Education Centre has partnered with community members from one of the poorest settlements in the city to improve surface quality water and access to sanitation. The community living on the banks of the Lotus River has limited access to quality municipal water and people use the river for waste disposal and washing. Their health is directly linked to the health of the river and the wetland system, which purifies the water naturally. The Siemens African Green City Index measured the environmental performance of Africa’s major cities. The index assessed 15 cities across six categories with up to three criteria in each category – one of which was the amount of green space per capita in each city. Of the 15 indexed, the average is 74 m2/person, nearly double the Asian average of 34 m2/person. The cities spanned a range of densities, though, from Luanda’s 0.1 m2/person – well below the World Health Organisation recommended minimum of 9 m2/person – to Johannesburg’s 230.2 m2/person at the other end of the scale. But lower densities of urban green space can be under-used. That space can become a hotspot for illicit activities. It’s therefore recommended that biodiverse cities have optimal traffic and usage to ensure safety. An additional trend is that the urban poor typically have fewer safe, accessible green spaces. 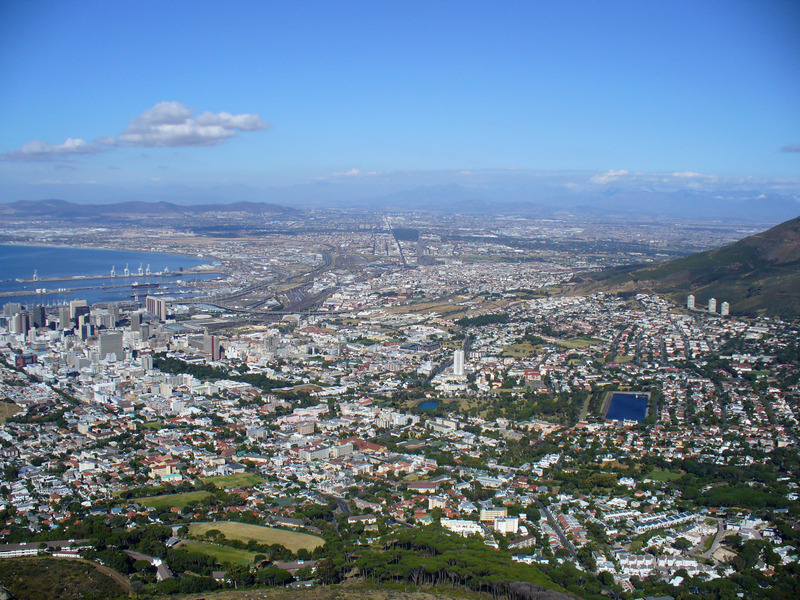 Although South African cities have relatively high ratios of green space, socio-economically poorer areas typically do not have parks and gardens that are suitable for outdoor leisure time. Instead, being on the periphery of the city, they are often side by side with large preserved areas, that experience low usage-levels for most of the year. This gives the urban poor a high ratio of green space but no regular experience of it for leisure activities. Landscaping in ways that respond to climate change has benefits that go beyond coping with droughts, floods and high temperatures. Done sensitively, it contributes to human health and well-being, integrates wildlife habitats and fosters learning opportunities. Kevin Winter, Senior Lecturer in Environmental & Geographical Science and Peta Brom, PhD candidate in Urban Ecology, University of Cape Town.